The fight back against industrial agriculture and for a just and sustainable future for farming and peasant farmers took a leap forward this week as the largest-ever European forum on food sovereignty concluded. After five days of discussions, the groundwork was laid to take back, relocalise our food systems and multiply food sovereignty platforms across the continent by the hundreds of participants at the second Nyéléni Europe Forum on Food Sovereignty. A huge diversity of people involved in the food system were present, including farmers, food and agricultural workers, trade unionists, researchers, activists, fisherfolk, pastoralists, indigenous peoples, consumers and human rights defenders. To tackle the destructive exploitation of the industrial food system, a number of key actions were chosen by the forum. These included strategies for just and equitable rights for farmworkers – and migrant workers, in particular – public policies that put natural resources (including land, water, and indigenous tenure rights) in the hands of local people instead of corporations, food distribution systems that put local, sustainable food first, a push for a binding UN treaty to regulate businesses and human rights, and a more inclusive movement that represents marginalised peoples. Central to these actions is agroecology, a radically local, inclusive, and sustainable approach to agriculture. Unusually for discussions around food policy, war and its effects were addressed, with the Turkish delegation noting that it was vital to stand up for peace. In opposition to rising nationalism across Europe, activists and supporters are uniting across countries from the East to the West, coming together and joining forces. Amidst the negotiation of toxic free-trade agreements, like the recently-signed CETA deal between the EU and Canada, which threaten the very existence of peasant farmers, peoples stand together with food sovereignty at the centre. 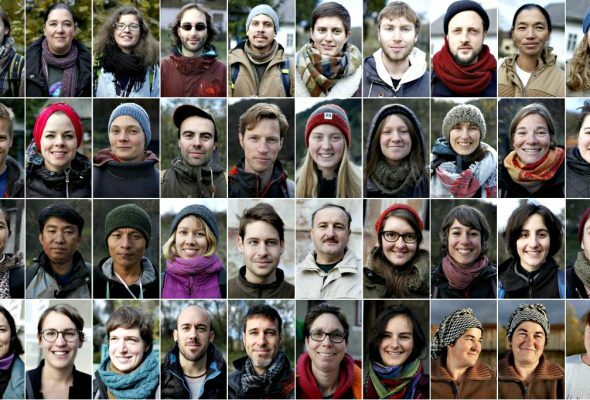 Read the Marginal People’s Nyéléni Europe 2016 statement. A photo reportage of the event is available on Flickr.